Every media theme of Trump's mind-bending campaign was foreshadowed at a house party way back in June 2015, when he was still learning how to campaign. Looking back now at my notes, I'm struck by how little has changed. That day, he attacked the media, calling out NBC's Katy Tur by name. He picked fights. He made big boasts and even bigger promises. He surprised and thrilled the voters. He even crowed about the crowd size. This is a "record setting crowd for a house," he said, while pointing to the media and saying, "They're not going to report that." He did pretty much the exact same thing on this Wednesday. "We have massive crowds. There's something happening. They're not reporting it. Katy you're not reporting it, Katy," Trump said Wednesday in front of thousands of people in Miami. Well, sure, the crowds are a lot bigger now. 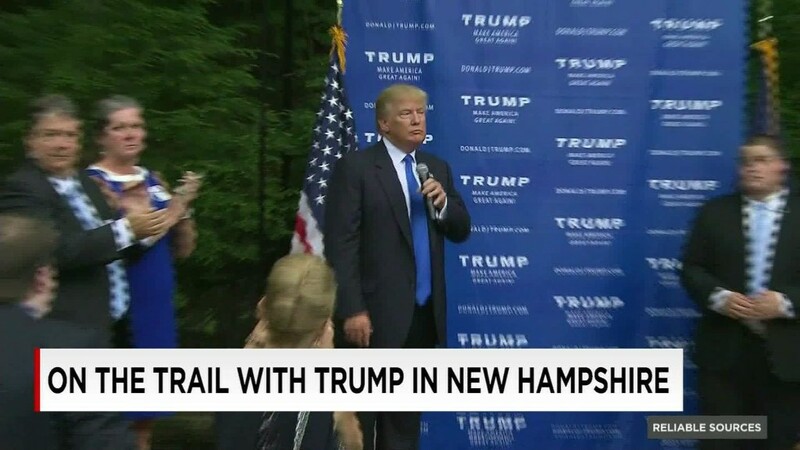 Only 200 people came out to the speech I attended in Bedford, New Hampshire, on June 30, 2015. The protesters are more numerous now, too. There was just one lonely protester that day. But Trump's media war was already well underway. He had only been running for president for two weeks. But he had already courted controversy: Univision and NBC had severed ties with him due to his offensive comments about immigrants from Mexico. On the way to Bedford, Trump's company announced that he had sued Univision for $500 million, accusing the network of breaching its contract to broadcast Trump's Miss USA pageant. This turned out to be the first of many public spats between the candidate and various news organizations. I drove to New Hampshire for Trump's first house party in the state to see the candidate up close -- and to see how journalists were covering his unconventional campaign. Tur sensed that Trump was here to stay, but some of the other media types at the event underestimated Trump, dismissing him as a novelty act that would soon wear off. By the time Trump came out to speak, the TV crews had been waiting around for hours, and were dodging raindrops on the far side of a swimming pool in the backyard of the host family. I noticed how some of the writers and photojournalists thought the whole thing was a joke. To be fair, many voters had the same impression of Trump early on. The cameramen traded quips during Trump's speech, pointing out his pompous statements to each other. Meanwhile, the local residents watched with rapt attention, despite the light rainfall. Afterward, I interviewed a New Hampshire woman, Sharon Gannon, who loved Trump's anti-media applause lines. "Oh, my gosh. I have been saying this for years," Gannon said. "I have been saying this for years. I don't believe the stuff the media says." Trump both tapped into his audience's existing distrust of the press -- and deepened it. "You got to trust your instinct. You can't believe the press. You can't believe the press," he said to the backyard crowd that day. He went on an extended speech about how "the truth doesn't get out, the media's not giving the truth," essentially challenging voters to choose between the prevailing media narrative or his own narrative. Interestingly, Trump said he thought he received fair coverage from financial news sources, but he said his initial experiences with the political press had been "very different." He told a story that later became a staple at his rallies -- about how NBC wanted him to keep hosting "The Apprentice," how the executives were "really angry when I said I was running for president," and told him, "Well, listen, come back to us when you're ready." But on this day, he was feuding with NBC, since the network had severed its business pact with him. Trump showed that he knew how to tell a captivating story with made-for-TV sound bites. NBC and Univision, Trump said, "abandoned" the pageant contestants ("51 wonderful girls!") by canceling the broadcast. An hour later, I was standing on the Van Anglen family lawn, reporting on the dispute for CNN. The 22-year-old who introduced Trump, Sean Van Anglen, told me Trump's campaign felt different because "he's a worldwide icon." Van Anglen was unfazed by Trump's digressions and personal drama. The candidate noticed Tur in the crowd and called out to her during the speech. He also said NBC's "Meet the Press" was "dying" (it is still alive), promoted his second place standing in a new CNN poll of New Hampshire, and asked "Is CNN here?" I opted not to raise my hand. "Now, this is CNN," Trump said. "They don't like me. Because I want the country to be great, and they don't know about greatness. They don't get it." Trump said he assumed CNN's poll "must be a legitimate poll because I'm winning in so many of these categories." The candidate even took questions from the crowd. One person asked, "Why don't you buy NBC?" He said if he were in charge, "I would fix NBC... I would be a great programmer." Later in the day, CNN's Anderson Cooper played portions of the speech, calling it "one of the, well, Trumpiest we've ever heard. And no matter what you may think of him, like him or not, it is fair to say we've never seen a candidate quite like this. Just watch." We all watched for 17 months. And it's uncanny how little has changed.